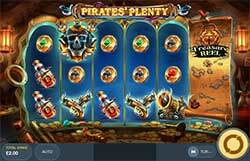 Unlock the Pirates' Treasure Reel for the chance of huge wins of up to 2,000x in Pirate's Plenty online slot by Red Tiger Gaming! This exciting new game takes you on a pirate's voyage in search of big wins. Set atop 5-reels and 20-lines, you can earn extra wins with Wild Ships that come with up to x5 Multipliers and other features like Ocean Spins where you can find the key to unlock sunken treasure! Unlock the Pirates’ Treasure Reel for the chance of huge wins of up to 2,000x in Pirate’s Plenty online slot by Red Tiger Gaming! This exciting new game takes you on a pirate’s voyage in search of big wins. Set atop 5-reels and 20-lines, you can earn extra wins with Wild Ships that come with up to x5 Multipliers and other features like Ocean Spins where you can find the key to unlock sunken treasure! Wild Ships Symbols – Extra tall Wild symbols which can cover an entire reel may appear with or without win multipliers. They substitute for all paying symbols and only appear when the Treasure Reel is unlocked. Treasure Reel – Collect Map symbols to unlock the treasure reel. Once unlocked, the Treasure Reel remains open for all future spins at the same stake. Ocean Spins – Unlock the Sunken Treasure chests during Ocean Spins to win more free spins and to turn low-paying symbols into wilds. Wild Monkey – The wild monkey substitutes for all paying symbols. It may appear on any spin except during Ocean Spins. Wild Monkey steals low paying symbols and triggers a re-spin with top paying symbols only. Normal Wild Symbols – Normal wild card suits substitute for all paying symbols. They only appear during Ocean Spins after unlocking treasure chests.